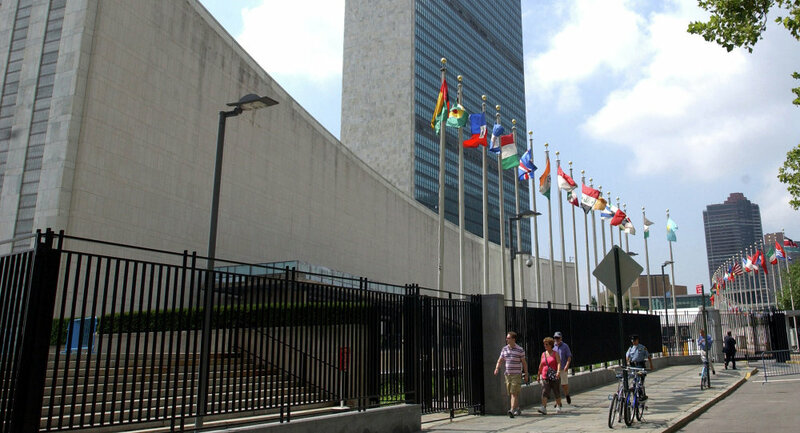 The United Nations' headquarters building in New York City was evacuated around 11 a.m. on Tuesday, a Sputnik correspondent reported. Later in the day, UN Secretary-General’s deputy spokesman Farhan Haq said that the evacuation took place due to security concerns but there was no actual fire in the building. UNITED NATIONS (Sputnik) — A security guard told Sputnik that the fire started in one of the utility services rooms and the staff was evacuated because of concerns that the toxic smoke would spread throughout the building. — Ryan Kaminski (@rykaminski) 18 июля 2017 г. Once the fire was contained and there was no more danger, the people were allowed to go back inside some 20 minutes later, the guard added. — Giorgio Tarraf (@GioTarraf) 18 июля 2017 г. Later in the day, Secretary-General’s deputy spokesman commented on the evacuation, dsaying that there was a problem with the alarms. "Earlier today there was a fire alarm that went off in one of the fan rooms in the 2nd basement, so we had to evacuate as a precaution in case of a potential fire but the alarm was checked. There was no fire, it was a problem potentially with the alarms," Haq said. Haq added that usually there are approximately 2,000 people present at the UN Headquarters, early on into the incident UN security services realized there was no danger for the people and the staff was allowed to come back inside. — Melissa Kent (@KentUNCBC) 18 июля 2017 г.
Evacuated from @UN headquarters. Fire, not a drill. Safe outside. — eMAGINE.IT.ALL (@emagineitall) 18 июля 2017 г. — Petra Bayr (@BayrPetra) 18 июля 2017 г. Large fans are situated in the basement of the building to keep the machines from overheating and a fire in this area potentially can present serious danger. NYC Fire department came to the premises and helped UN security services investigate the incident, as a result they confirmed there was no danger for UN staff, Haq explained.